Please welcome Davila LeBlanc to The Qwillery. 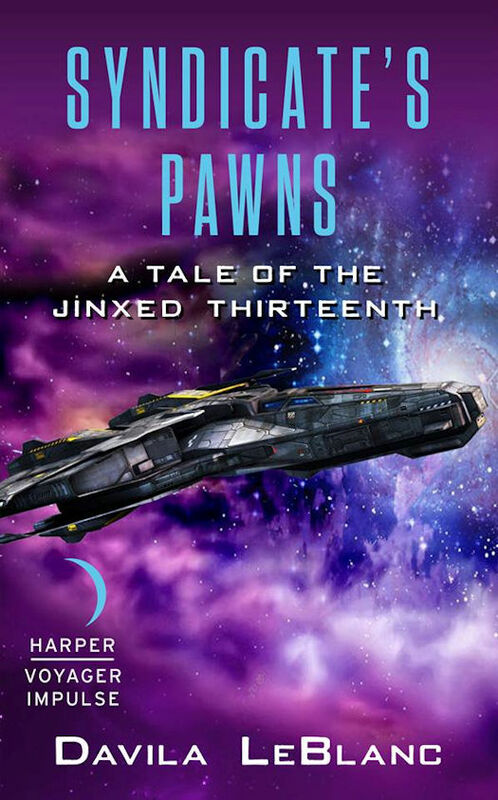 Syndicate's Pawns, the 2nd Tale of the Jinxed Thirteenth, was published on July 5th in digital format by Harper Voyager Impulse. DaV: I've always loved reading and I can remember writing my first "book" when I was ten. I've been writing ever since. On a more practical sense of the of the word, I've been writing professionally for the past fifteen years. I have a very active imagination, and in my younger days I found myself hating on everything I read or watched. Nothing was ever good enough for me. It was then that I realized that it was time for me to either put up or shut up. If no one was writing the stories I liked, it was time for me write my own. DaV: I am a hybrid of the two. I like to blueprint my stories and set up the main beats and plot points. I've worked in film and television for quite some time and I remember someone telling me once that any good work of writing would have been eighteen times better if it had been outlined beforehand. I really do take those words to heart and try to do the same when I'm plotting out my books. I don't cement it in stone though, because sometimes I'll have a flash of inspiration and wind up deviating from the outline. The biggest challenge I have with writing is getting started, and once that is going on, the hardest part becomes stopping. TQ: What has influenced / influences your writing? How does writing for TV affect (or not) your novel writing? DaV: Oh the works of Tolkien, Herbert, Leguin, Stephen King, Steven Erikson to name but a few have profoundly affected me. If I had to pick one I would say that it was Stephen King's original "Gunslinger" which made me say: "One day I'm going to have to write something as good as this." My experience in television has really helped me as a novelist. The main thing I gained from television was a sense of pacing. I really like to keep things moving and that is really something I picked up during my time in television and cinema. 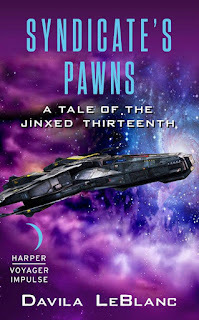 TQ: Describe Syndicate's Pawns (A Tale of the Jinxed Thirteenth #2) in 140 characters or less. DaV: The mettle and wits of the Jinxed Thirteenth's crew will be seriously tested as they square off against an elite band of criminals. TQ: Tell us something about Syndicate's Pawns that is not found in the book description. DaV: It is a fun action packed book and what really makes this one different from the first are two things. One: Jessie Madison is more active a character in the book. Two: a great deal of the cast are women, and that includes the villains. Jessie Madison is going to grow in this new world she finds herself in, make friends and enemies along the way and become a hero in her own rights. 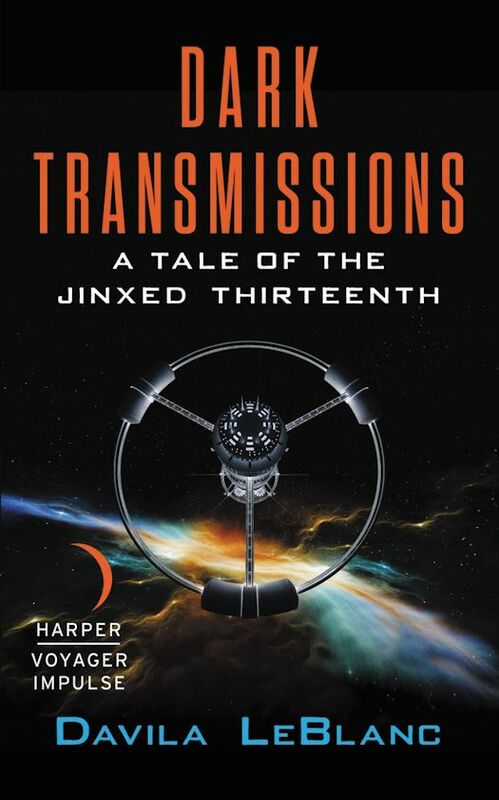 TQ: Both Dark Transmissions and Syndicate's Pawns are novels in the Jinxed Thirteenth series. How do the books relate to each other? DaV: Well Syndicate's Pawns takes place in the aftermath of Dark Transmissions. What I wanted to do was answer the questions left un-answered at the end of the first book, reveal more of the inner-workings of the world I'd created, present an adventure to the readers and raise-up more questions for the readers, to be answered in a third book. TQ: What sort of research did you do for Syndicate's Pawns? DaV: I watched a lot of documentaries on the war on drugs in south America, at first it was just to come up with a bit of flavour for the Syndicate (the intergalactic criminal network). I wanted to give my criminals in a bit of real world edginess to them. From how they operated to how they punished betrayal. Truth be told nothing I came up with was as disturbing as reality. TQ: In the Jinxed Thirteenth series so far who was the easiest character to write and why? The hardest and why? DaV: Morwyn Soltaine has been the easiest, I identify with him because he is man of principles and has a code of honour. Much like me. Jessie Madison is also an easy one, she is based on my wife Jessie Mathieson, she is my muse and inspiration and any time I need to come up with something compassionate I just have to ask myself what she would do. Domiant was the hardest character to write as, mainly because he is an incredible immoral character and well I'm just not an immoral person. I also have to skate a fine line between making a character evil yet still likeable. Chord, was the funnest one to write but was hard because I had to come up with ways to avoid using gender while describing a machine's perspective. If you read Dark Transmissions you'll notice that I never refer to Chord as a "him" or "her", THAT was really hard. TQ: Which question about Syndicate's Pawns or the Jinxed Thirteenth series do you wish someone would ask? Ask it and answer it! DaV: How many books do you have planned for this and will it come to an end? I've got eight books planned and yes there is a definitive ending planned and Jessie Madison, Chord and Morwyn will have a role to play in it. TQ: Give us one or two of your favorite non-spoilery quotes from Syndicate's Pawns. DaV: "I have already died once Captain Morwyn. There is no other side, only darkness." "The Infinite lies between you and me. And you of all people should know how far my reach is." DaV: Well I am presently discussing with Harper Collins Voyager for more books in the Jinxed Thirteenth Series, like I said I've been outlining the series and would love to publish with them. This year my first screenplay: DEADSHACK is going into production and my creative partner in crime and myself are working on two more horror screenplays. I am going to be working on several television series concepts and will probably be getting back into children's animation. I took some time off television to work on my books. Also I recently got married to my wife Jessie Mathieson, we are working on getting a visa so we can live together in Maine. Ultimately I'll be working on writing and improving myself as both a storyteller and author. DaV: Thank you for having me. In love, light and laughter, be well. It is the late 23rd century. For engineers Jessie Madison and her husband David, a routine maintenance contract on board the orbital mining station Moria 3 has become a nightmare. Upon awakening from cryo-stasis, they learn a horrifying truth: while they were asleep, machines rose up against humanity...and won. Navigating the fringes of explored space in the Covenant Patrol vessel the Jinxed Thirteenth, Captain Morwyn Soltaine picks up a distress signal from a space station. But it’s broadcasting in Ancient Humanity, a language that has been extinct for several millennia. Even more incredible: there are two survivors on board. Morwyn’s rag-tag crew of reformed criminals mount a rescue op, unaware of the dangerous foe awaiting them. As the past and future collide, a routine mission becomes a deadly game of wits. Davila LeBlanc spent his college years studying print journalism but quickly found himself working as a writer and performer in the comedy circuits of Montreal. During this time his goal became to break into the world of professional writing. He would get his first opportunity when he co-created and sold the hit animated television series: “The League of Super Evil.” This was his first foray into the world of production and an important first step on his road to becoming a writer. After working on various television shows, in 2013 Davila decided to take a year off from children’s animation to focus on writing his first novel, Dark Transmissions. He is an avid reader of science fiction and fantasy and wants to add his own voice to the genre that inspired him. Davila currently resides in Ottawa where he is working on several other writing projects.